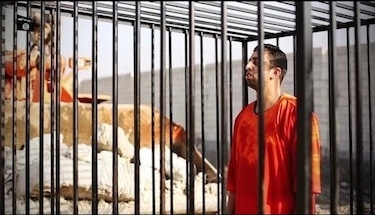 The Islamic State's burning to death of a captured Jordanian pilot is the focus of two documents translated below. Jawad al-Tamimi examines the various militia forces holding sway in the southern front in Syria, along the border with Jordan. He concludes that IS is "absent or weak in the south," dismissing IS's claims to be affiliated with some of the militias operating there. Proposals to building an anti-IS coalition in the south are not presently feasible, however, as "the rebels in the area are too focused on fighting the regime, and the bulk of ISIS territory and resources lies too far away." A document released by IS's al-iftaa wa al-buhuth (Fatwa and Research) committee, which is responsible for producing Islamic textual justifications (Quran verses, hadiths, events from early Islamic history) for IS actions. This one is headlined "What is the ruling on burning the kafir [disbeliever] with fire until he dies?" Names cited in the document, such as fifteenth-century Egyptian jurist Al-Hafiz ibn Hajar, are identified in Jawad al-Tamimi's annotations. Statement from the Naqshbandi Army (Jaysh Rijal aṭ-Ṭariqa an-Naqshabandiya, or JRTN), a secular-leaning Sufi Sunni Iraqi group associated with former Baathist army officers, condemning IS's burning alive of captured Jordanian pilot Muadh al-Kasasbeh. Notable for its effusive praise of both the pilot (e.g., "heroic martyr") and the Kingdom of Jordan (e.g., "a land deep-rooted in its creed and authentic in its Arabness"), as well as characterizing IS's methods as similar to "the evil hands of sectarian and racist [Shi'a] militias whose loyalty is to Iran."